"I would like my career to grow, but I don't want to have a big career doing something I don't want to do." 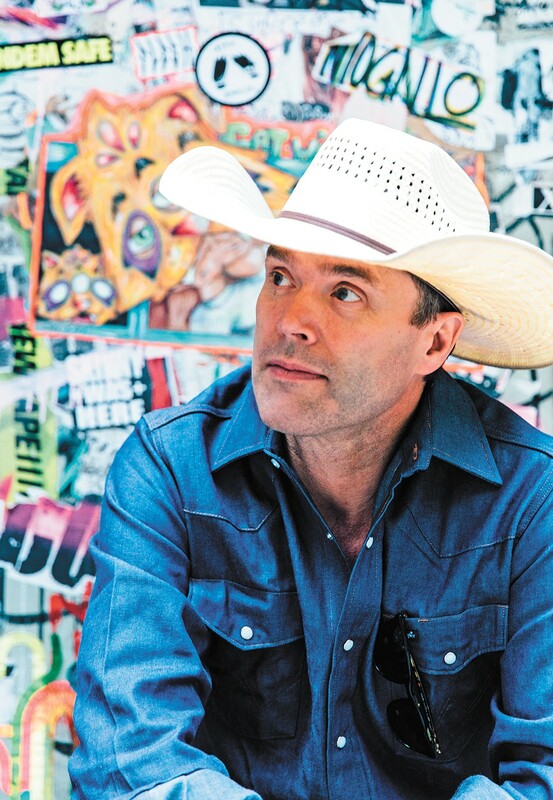 Corb Lund has always kept one scuffed, dust-covered cowboy boot in the twangy sounds of traditional country-western music, and the other in, well, the weird. His output is decidedly retro in style, channeling the country story songs of yore, but there's also a sense of modern adventurousness to it. What might be most surprising, though, is that he's also got a fondness for straight-ahead rock 'n' roll, having played in a metal band called the Smalls in the '90s. "It was a real indie, underground thing, and in that world, you're encouraged to be as unique and different as you can," Lund tells the Inlander. "That's kind of how my songwriting was forged. I think my musical style is ... really deep family history mixed with indie-rock quirkiness." Regardless of how you'd describe it, one thing's certain: Lund's music is a far cry from the impersonal, assembly line country-pop you hear on mainstream radio, and he surely couldn't see himself ever working out of the songwriting factories of Nashville. Based in Alberta, Canada, Lund comes from a long line of cattle ranchers, and that background is baked into his work. His first exposure to country music was through the Old West ballads his grandfathers used to sing to him, which led to an obsession with singing cowboys like Marty Robbins, who was able to distill an entire narrative arc into a matter of minutes. "I'm a story-song nut, guys like Kenny Rogers and Johnny Horton and Jerry Reed," Lund says. "I'm all over that stuff." He also points to the work of singer-songwriter Bobbie Gentry, whose music often possessed a playful sense of experimentation and a morbid sense of humor. Lund brings up her 1968 song "Casket Vignette," in which a woman is picking out a coffin for her recently deceased husband. "The funeral director is consoling her and comforting her because her husband died," Lund says, "but at the end, it turns out she's happy that he died. And they're picking out the color of the interior of the casket. I mean, who thinks of that? It's awesome." Like Gentry and other singing storytellers of country music's past, Lund's lyrics have a specificity to them, and they create specific characters and explore their inner turmoils. In "S Lazy H," a rancher watches as his family dissolves and his land is sold out from under him. "Student Visas" is inspired by a conversation Lund had with an American soldier about his involvement in the anti-Contra operation in 1980s Nicaragua ("Did Reagan give the order? / Did cocaine pay the bills?" Lund wonders). "Bible on the Dash" is decidedly more upbeat, chronicling a traveling country band consistently dogged by the cops as they zip across state lines. He's also inspired by his own family lore, by the ancestral tales that grow taller as they echo their way down through generations. Right now, he's working on a song about an uncle who used to go to dances with his spurs on and start fights, and another about a great-grandfather who opened a saloon on the outskirts of a dry county in Utah. "I've got a whole cast of characters to draw from," Lund says. "Grandpas and great-grandpas and uncles who were all ranchers and rodeo people, bootleggers and card cheats." Lund has been playing with the same three-piece backing band, dubbed the Hurtin' Albertans, for years now. They've developed, as he describes it, a "musical ESP." "We don't even use a set list anymore," Lund says. "I have hand signals for which song we're going to play next." It's obviously working: They're playing bigger venues each time they make their way back to the U.S., and they've sold out their upcoming Bartlett concert. "In Canada, we're a little more well known," Lund says. "We play small hockey arenas and stuff up here, whereas in the States we're still doing bars. But it's definitely growing. We've been around for ages in Canada, but in the States in the last few years people have just discovered us." And while that discovery continues, Lund hopes he can expand his audience with the intimate, personal music with which he's become a Canadian favorite. The original print version of this article was headlined "Story Songs"